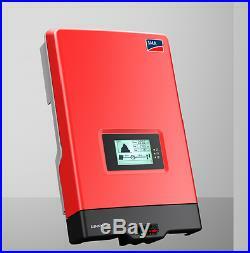 Inverter are in full working condition, removed from working systems due to upgrade to 3 phase or battery inverters. For all working time there was no problem at all with these SMA inverters. Each inverter with bluetooth communication Q-module (easy to set up monitoring with Sunny explorer). I will fit each inverter with: wall mount, 2 x SunClix connectors, AC plug and General Electric circuit breaker B20 or B16 on your choice. The Sunny Boy HF offers a nearly unlimited range of options for the planning phase. A wide input voltage range of 175-700 volts means that most configurations can be covered by just two strings. That not only reduces the number of module strings, but also saves installation time and effort – and, thus, costs. At SMA, it goes without saying: you and can expect top marks when it comes to efficiency, all based on our knowledge, experience, and nearly 30 years of being the technology leader. When designing the new Sunny Boy, that´s a standard we uphold. 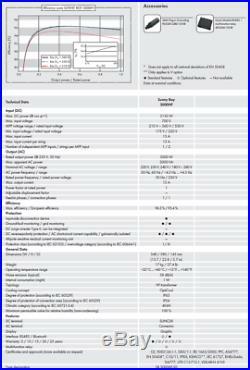 In addition to innovations such as OptiTrac and OptiCool, our galvanically isolating inverters offer the highest yields in their performance category. The integrated plug-in systems mean that you can leave your specialist tools in the garage when installing devices of the new Sunny Boy HF series. The process is fast, easy, and efficient. Beautiful and simple: an elegant design, a large graphic display, and a Bluetooth® interface make the new Sunny Boy HF especially user-friendly. A wide range of advantages speak for themselves. The large graphic display speaks a language anyone can understand. It provides the current daily values and relevant plant information on a clear text display using definite symbols. Clear, user-friendly, and easy to understand. Installation is now easier than ever thanks to the DC connector system SUNCLIX, the plug in generator grounding (optional) and an easily accessible configuration area including easier mounting due to the reduced weight. The wide input voltage range from 175 to 700 volts gives you extraordinary flexibility for your plant design and the modern graphic display and wireless Bluetooth communication system make the devices highly user-friendly. Maximum efficiency 96.3%. The best tracking efficiency with OptiTrac MPP tracking. Shade management with OptiTrac Global Peak. Quick and easy configuration thanks to Quick Module. DC plug system SUNCLIX. Suitable for generator grounding. The item “SMA SB3000HF-30 Grid Tie Inverter/Wechselrichter (not kostal, abb, solaredge)” is in sale since Thursday, November 30, 2017. This item is in the category “Home & Garden\Home Improvement\Electrical & Solar\Alternative & Solar Energy\Chargers & Inverters”. 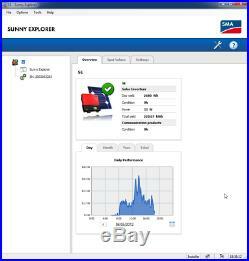 The seller is “solarprosun” and is located in Riga. This item can be shipped worldwide.